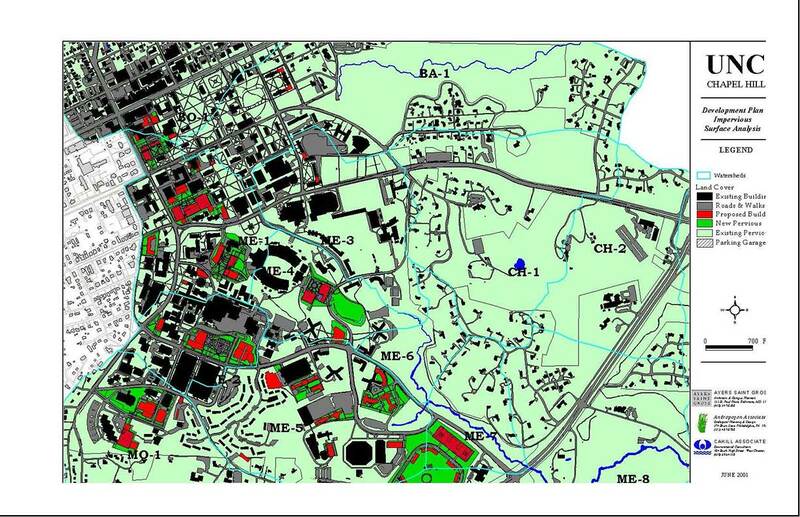 This document represents a common understanding of Town and University officials regarding what will be expected and accepted as fulfilling the requirements of Section 16.3.1 of the Development Ordinance for information on Stormwater Management to be submitted as part of a Main Campus Development Plan. Stormwater treatment shall be designed to remove 85% of Total Suspended Solids. Stormwater treatment shall occur on the volume of post-construction runoff resulting from the first 1 inch of precipitation. Post-development runoff conditions shall be such that either the runoff volume draws down to the pre-storm design stage within 5 days but not less than 2 days; or, the post-development discharge rate shall be no larger than the pre-development discharge rate for the 1-year frequency, 24-hour duration storm event (3.00 inches). Stormwater treatment shall occur prior to entering the Waters of the State. The discharge rate of post-construction runoff, at all locations where stormwater runoff exits the land area in the development plan, shall not exceed the pre­development or existing conditions discharge rate for the local 2-year (3.60 inches), IO-year (5.38 inches), 25-year (6.41 inches), and 50-year (7.21 inches) frequency, 24 hour duration storm event. Based on the USDA, Soil Conservation Service methodology for runoff depth, the post-construction volume of stormwater runoff shall not exceed the pre-development (existing conditions) volume of runoff for the 2-year frequency, 24-hour duration storm event ( or 96% of the rainfall that statistically would occur in a 100-year period based on the record data) at locations where stormwater exits the OI-4 Zoning District. This may be achieved by hydrologic abstraction, recycling and/or reuse, or any other accepted scientific method. All new development will conform with these criteria. The University is currently undertaking a storm water improvement plan that is intended to implement projects that reduce the volume and rate of runoff from existing campus development. 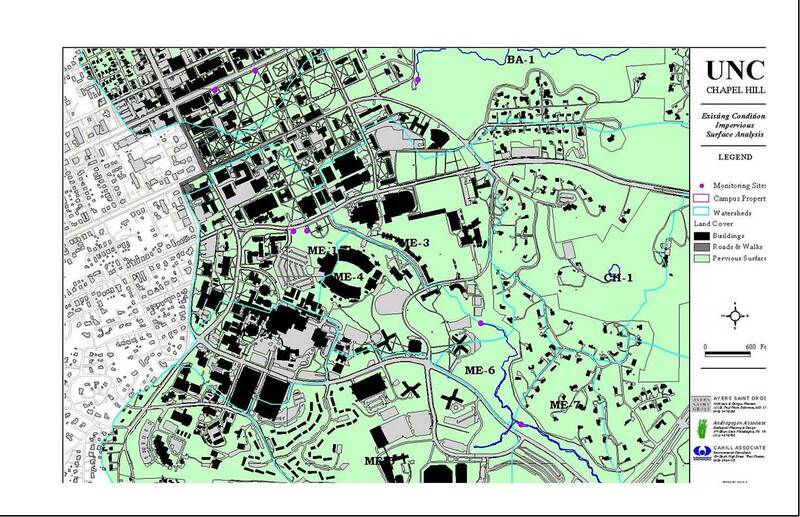 This plan will assure that no increase in volume will be generated from the UNC mam campus following new development. Stormwater management and treatment practices shall comply with all applicable Federal and State regulations, and revisions thereof. At a minimum, any structural best management practice(s) for sedimentation and erosion control, post-construction stormwater treatment, and discharge rate control shall be designed, constructed and maintained in accordance with applicable federal and state design, construction and maintenance requirements. The Development Plan may implement any structural or non-structural best management practice to manage stormwater runoff in accordance with the post­-construction runoff control criteria. These standards are subject to any applicable revision(s) to Federal or State regulations. Design(s) for all structural best management practices associated with a Site Development Permit shall be sealed by a Professional Engineer, licensed in the State of North Carolina, with demonstrable expertise in stormwater management engineering practices. All applications to the Town for a Site Development Permit shall include a signed and sealed letter from a Professional Engineer indicating the locations in the drainage area ( see attached map) and the methodologies of how stormwater management measures associated with the permit application will meet or exceed the performance standards described herein as part of an approved Development Plan. Post-construction runoff control measures, utilizing best management practices, shall be installed coincident with or prior to Site Development Permit activities. Outfall monitoring by the University shall occur periodically as described in a, b, c, and d below. The types of monitoring will include stream gauge or stream flow data collection, visual inspection, and/or benthic sampling depending on the location. The data will be used as baseline information for ongoing system response analysis. Meeting of the Waters outfall: A stream/rain gauge will collect and measure precipitation, stream flow, selected ambient water chemistry and stormwater data. Benthic sampling will be conducted at a minimum every 6 months, based on appropriate scientific methodologies. Morgan Creek outfall: Visual inspections will occur quarterly at the outfall behind the south chiller. These inspections will monitor and report physical conditions including channel stability, scour, sedimentation, or any other physical characteristics associated with stormwater runoff exiting the tract. Battle Branch outfall: Visual inspections will occur quarterly at a selected location where the stream becomes clearly defined below the confluence with its tributaries. The same visual monitoring methodology will be used as described in (b) above. Bolin Creek outfall(s): Visual inspections will occur quarterly at appropriate inlet locations along the tract boundary and Franklin Street. The inspections will monitor for sedimentation and/or debris buildup. The University will store the information collected, according to the above monitoring procedures and will provide the data to the Town upon request. The management of stormwater runoff through engineered structural and/or non-structural best management practices designed to meet or exceed required North Carolina Division of Water Quality water quality performance standards. Facilities designed to provide stormwater treatment to remove pollutants from non-point source runoff through physical removal and settling, filtering, chemical reaction, and/or bio-chemical transformation. Regulations, programs and practices designed to reduce or eliminate pollutants in stormwater runoff. * A precedent has been established by the NCDWQ defining “Waters of the State” as blue-line streams shown on the USGS quadrangle maps or soil survey maps. Stormwater runoff as a result of re-development or development activities. The reduction of total rainfall to effective rainfall through runoff interception, infiltration, surface storage, evaporation and/or evapotranspiration. * At their meeting July 2, 2001, the Chapel Hill Town Council approved these standards with amendments. Final standards are not available at the printing of the Development Plan.